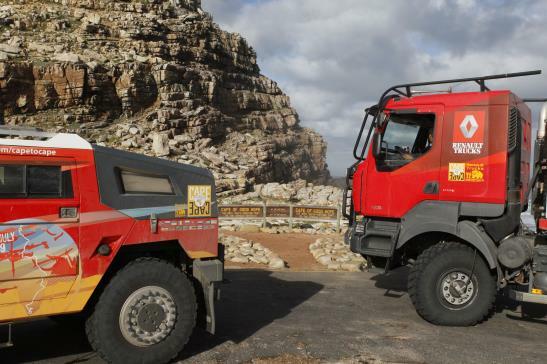 Having left the North Cape on the 1st March, the teams of the Cape to Cape trek arrived in South Africa, thus completing a technical and human adventure with undeniable commercial and media impacts. After travelling 30,000 km across 17 countries, they were greeted in a festive atmosphere by the president of the Renault group who wasn't about to hide his satisfaction at having risen to the challenge against a difficult economic backdrop. A real showcase for the Renault group, this ambitious project was a veritable success in heightening visibility. The expedition provided an opportunity to put on 15 commercial events involving about 3,000 customers, of whom 150 were welcomed on board the vehicles. During the operation, 300 vehicles were ordered by Russian, Polish, Hungarian, Turkish, Argentinian, Kenyan, Namibian and South African customers. Negotiations were started for 500 new contracts and for military contracts. No less than 1,300 articles or reports broadcast in a hundred countries reported on the event, winning Renault Trucks an indisputable reputation.